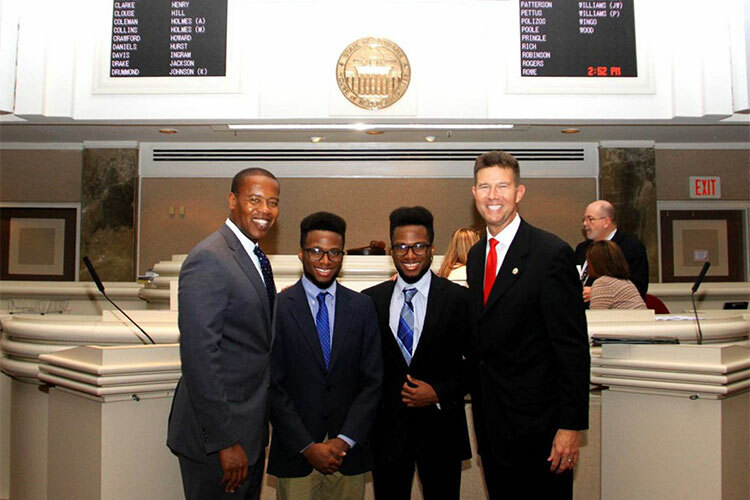 Mark & Michael Cebert with State Representative Anthony Daniels (D; left), and Alabama Secretary of State John Merrill (R; right). As history and political studies majors at Pacific Union College, brothers and Maxwell Scholar finalists Mark and Michael Cebert were required to complete an internship as their capstone project as part of their degree. To this end, they worked together for state representative Anthony Daniels (D) in their home state of Alabama. Despite the project only requiring one month of interning, the Ceberts ended up working for three, since they were well-liked and tackled some large projects. In February 2017, Daniels made history when he became the first black person and, at 34, the youngest individual ever to hold his legislative position. Mark and Michael’s interactions with him, however, began several months earlier, in the summer of 2016. The brothers spent their first few weeks building a donor database for the Democratic party in the state. Despite its advanced age, the Alabama democratic party has historically never tracked who their biggest and longest-term supporters were. At least, not when Mark and Michael arrived. Daniels’ long-term goal was to increase voting by 20 percent among minorities in Alabama. The Cebert brothers were to be a large part of working toward that goal, which meant compiling donor data from scratch. And they did it from a small room in the back of a dental office. Day after day, hour after hour, Mark and Michael combed through Federal Election Commission (FEC) records, conducted online research, and talked with city counselors. The democratic party had received over 60,000 donations by 10,000 individuals in the last 20 years, and the Ceberts were tasked with making sense of all of it. The result was the first donor database for the Democratic party of Alabama, listing names, how much was donated to which campaign and when—a document that will now be fastidiously maintained and monitored. With two weeks of intense research and data compilation under their belts, Mark and Michael tackled their next project: Policy development. This is where their PUC experience came in handy. The brothers also attended a prison reform summit in Birmingham with the objective of gathering statistics in order to put together a plan of prison reform on behalf of Representative Daniels. This is a hot topic in Alabama, since the state, along with 12 others, has a higher incarceration rate than any country in the world, and is third in the U.S. in incarcerations per capita. “I put a plan together based on my findings, but these things get tabled all the time because it’s politics and there’s always something more important to talk about after you’ve done all the work,” Michael says. A second database Daniels asked the brothers to develop was one of businesses and churches in key positions for reaching potential minority voters, especially in black communities. This required Mark and Michael to identify minority-run businesses, African-American and Latinx churches, and newspapers and radio stations managed by minorities. Many media outlets don’t advertise who runs them, so beyond small local stores, there is almost no way of knowing who runs what. Mark and Michael put together a list of hundreds of businesses and churches, something to which the Democratic party in Alabama has never before had access. Mark and Michael also attended a special legislative session in the state capitol, and were granted page passes to access the floor, meaning everyone thought they were there to run errands when needed. Additionally, Mark and Michael began work on a coalition website where Alabama democrats can unify on big issues such as immigration for Hispanic groups, prison reforms for black groups, and more. Their positions as representative interns allowed the Ceberts to sit down with many politicians on both sides of the aisle. Despite the busyness and the stress of their internship, Mark and Michael agree it was overall a great experience, giving them each a better idea of what they want for their future careers. Michael’s experience helped him decide that he wants to be directly involved with and understand the people he serves. For information about the history, political studies, and ethics program at PUC, visit puc.edu/admissions or call (800) 862-7080, option 2.